Jesse Wilde delivers catchy, southern-tinged rock with great passion and stadium confidence. 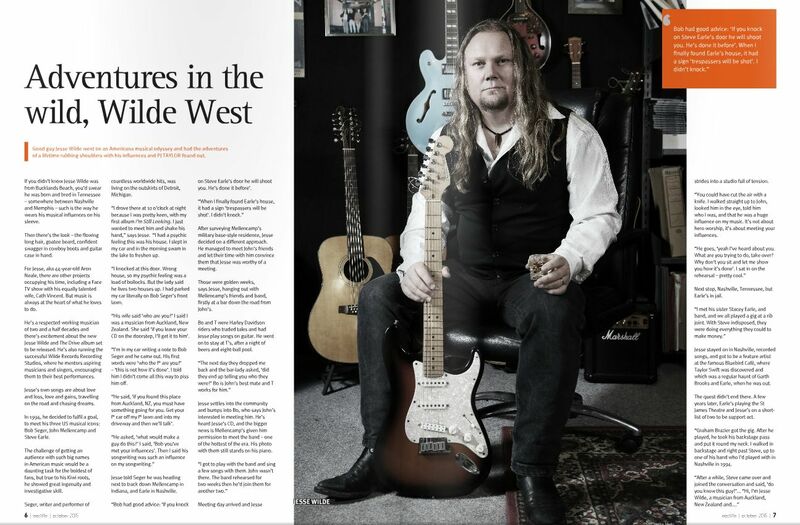 Says Real Groove Magazine, “home-grown singer-songwriter guitarists seldom sound as international as Jesse does”. Wilde’s gravelly voice – which is reminiscent of Bruce Springsteen’s for sheer power and emotion – cuts through rock tracks like a musical chainsaw. Add this vocal style to his latest, impeccably crafted ballad Fallin’ and the result is memorably honest, raw and vulnerable. This single, produced by Chris van de Geer of Stellar* fame, has a lilting catchy refrain that makes it highly accessible. Wilde was formerly the front man for folk-rockers Acoustic Attitude, a prominent 90s band regularly packing the house at the legendary Auckland venue, The Gluepot. His growing popularity continued with his next band Fiesta Drive which sounded “like the love-child of Steve Earle and Jimmy Barnes”, said NZ Musician Magazine. During his rock pilgrimage of the UK and USA, Jesse sought out and met all of his major music mentors including Bob Seger, John ‘Cougar’ Mellencamp, and Steve Earle, so it’s no coincidence that their influence oozes through his original songs. During subsequent trips to the US, Jesse spent eight months writing and performing in Los Angeles, Texas, New York, Chicago and Nashville. He co-wrote the song Ghost Town Road with gold record award-winning writer Rick Beresford. One of Jesse's songs was also selected by the Don Williams Music Publishing Group at the Los Angeles Songwriters Showcase. It’s the irresistible self-confidence that he exudes in every live performance, and the vibrant arrangements of his original material that makes the crowd go ‘Wilde’. When Cath Vincent decides there is something she wants to do, there's not much that will stop her. She also believes its important to "walk your talk", so she's always looking for "Next Big Hairy Audacious Goal!" A business consultant for over 20 years, Cath has worked on multi-million dollar infrastructure projects, launched businesses in the UK and Australia, and won a UK Department of Trade and Industry Award for her own start-up software company. Originally from the UK, Cath emigrated to New Zealand and launched a brand new career as a motivational speaker, developing a strong following in a country where she knew no-one. She quickly gained recognition from audiences internationally, her peers, and the National Speakers Association and within three years, she was presented with the aptly named Brightstar Award. 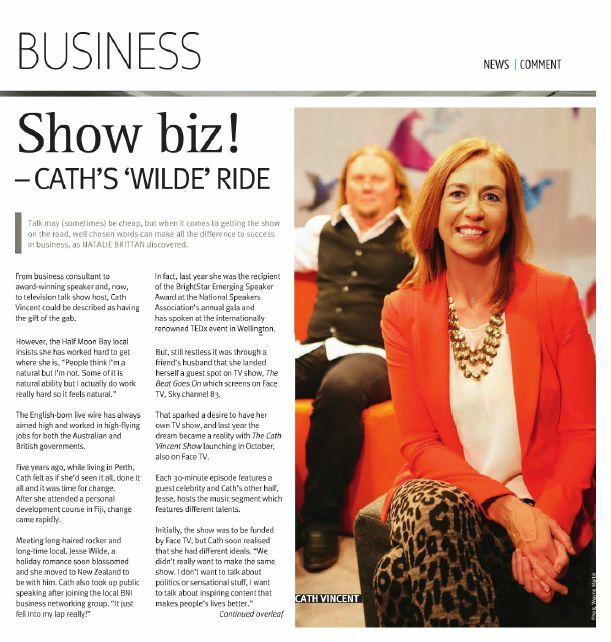 Just five years after getting off the plane in Auckland, Cath launched her own motivational television show, The Cath Vincent Show, which begins its third season early in 2017 and will air on SkyTV. Being a host on her own television show wasn’t enough for Cath and she decided to build her own television studio and venue, hence Studio 38 was born.